caption from image ~ The more you stay in the space of love, the more you find yourself in happiness. Society/life/humanness lures us into a place that questions love's existence, that questioning pulls us away from love and love's embrace. We question, and that creates a resistance which reinforces the idea of separation from what we eternally are when we give up the resistance. L O V E is. 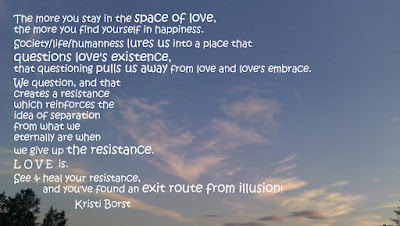 See & heal your resistance ... and you've found an exit route from illusion! For many of us, peace is a dream. There are so many things that bother us, whether it's news of world happenings, things happening in our town, strife at work or home, and/or inner turmoil. We cannot change things external to us, until we have changed within. Otherwise we actually increase our lack of peace and resistance ... Awareness = The Power of Choice = The Power to Change! I invite you to accept, for ever increasing moments each time you think of it, that the core of your essence is Love. From this understanding, we find the root back to love is within. It is not outside of you! "Chasing the dream" is an all-too familiar quest for individuals in the western world. Many are finally learning that reaching outside ourselves for happiness merely results in our acquiring lots of stuff and gaining little satisfaction. We may feel separated from that Love because others have trained us to live small. From the time we could understand our parents and peers, we may have consciously and unconsciously agreed to hide our unique essence or "fingerprint" of Love, in order to fit in or please. Were you told "don't be too full of yourself?" If you can't be full of yourself, WHO ya gonna be? Herein lies some of the anxiety and depression that many people are experiencing. We were created of love. We hold love. We are love. Getting back to feeling the presence of love is difficult when we search outside of ourselves. When we realize love is already within, we finally see our power ... yikes, it was there, hidden in plain view all along! Ultimately we each hold the power for our own peace. We merely need to see(ze) our power, by making more conscious decisions about the emotional energy we hold onto. Invite the presence of love to be felt more strongly within your being. As you stand in this Presence, you more easily connect to your happiness. You can relax, knowing you are standing in love, making decisions in love, moving through the world as love. As you face love, you see love. As you see love, you feel love. As you feel love, you radiate love. In a nanosecond, your world changes and you are suddenly surrounded by love rather than feeling separated from it. The same is true for any emotion ... if you choose to focus on fear, you see fear. As you see fear, you feel fear. As you feel fear, you radiate fear. Of all emotions, the emotion that serves the Highest Good is LOVE. I believe LOVE is a building block of all life. Your human body and our world are nourished by love. Why not choose love? Awareness = The Power of Choice = The Power to Change! It's okay that you haven't known to make this choice before. Let that go. Be loving to your past selves and others. We're all just doing the best we can with what we know and how much we feel separated from love. The separation is illusion. You can start fresh, right here, right now. Show up as love in our world ... choose love! It's win/win! I welcome your thoughtful, heart-based comments, questions & responses.